It's hard to find prime grassland where you don't see signs of grazing. This is what makes the National Audubon Society's Appleton-Whittell Research Ranch near Elgin, Ariz., so valuable. A bitter, five-year congressional fight over the world's first engineered nuclear waste dump has been settled in time-honored fashion: in the back room. 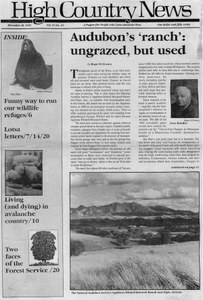 Prodded by stinging internal audits" and the likelihood that Congress will pass a sweeping reform bill in 1993, Bureau of Land Management officials are pushing a new grazing fee policy they hope will resolve the controversy over use of public lands by livestock.